They say spontaneity is the spice of life and I couldn’t agree more, especially after having spontaneously made this dish, as it is most definitely spicy. When you go about making this (and you absolutely should) save yourself some time by buying pearl barley and not hulled barley. Pearl barley takes 15-20 minutes to cook, whereas hulled barley takes 45-50 minutes. I also used frozen spinach because it’s what I had in the fridge but fresh spinach or kale would also work really well. 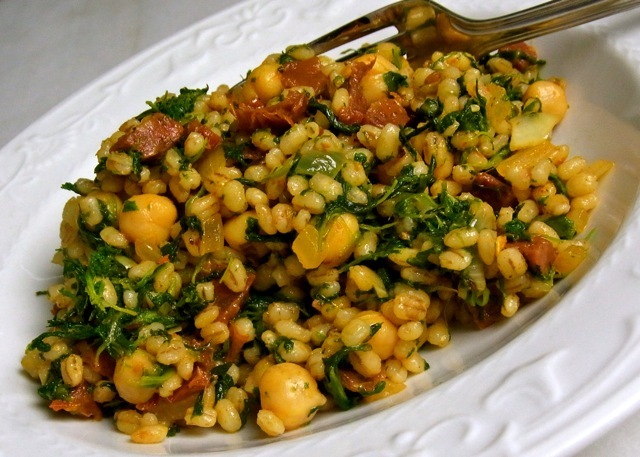 Place the pearl barley in a medium saucepan, along with 2 cups of water and ¼ teaspoon sea salt. Cover and heat the pan on high, bringing the water to a boil. Once the water is at a full boil, reduce heat to low and simmer for 15-20 minutes. The barley should be al dente. Once the barley has cooked, drain and set aside. Return the saucepan to the burner and increase the heat to medium. Add the oil, onion and chorizo to the pan. Continue to sauté the mixture until the onions have begun to become translucent and the chorizo has released its paprika stained oil. Then add the red pepper flakes, paprika, salt and pepper. Stir the spices into the onion and chorizo mixture. Next add the sun-dried tomatoes, spinach, garbanzo beans and barley. Mix until ingredients are well combined and heated through. Check for seasonings. Serve warm.